Before making a start I did a search to see if anyone else had done one. 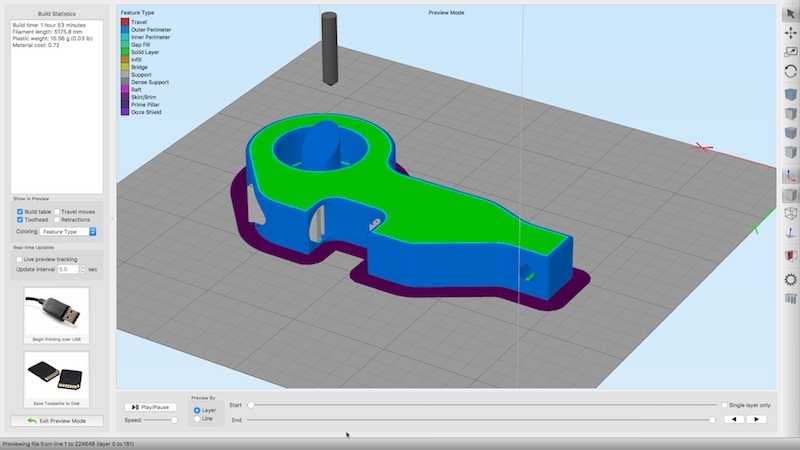 This popped up on Thingyverse, it's a useful starting point. I loaded the IGS file and looked round to see what parts I had to hand. Inline skate bearings, a cheap plastic level that came with a set of Bosch drills. I actually scored 3 vials in the level, but opted to use the 25mm x 10mm one. This didn't match the one used in the 3D model I just downloaded. 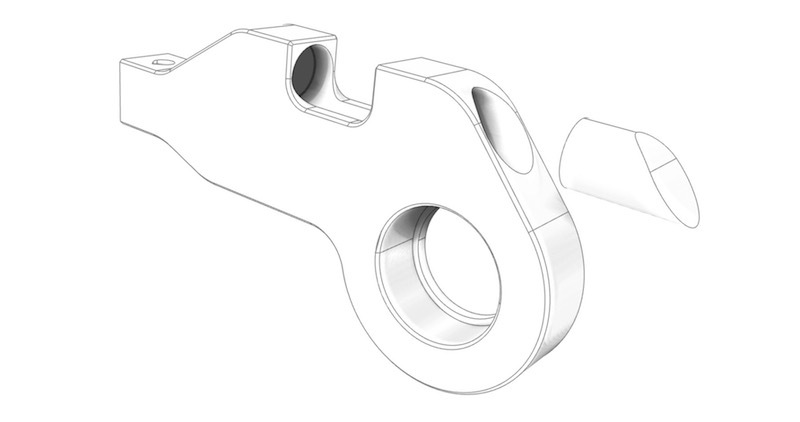 A bit of time in Rhino got me a useable model that would also make use of my bearing. I output the model as an STL file to Simplfy3D (use whatever slicer) to configure the print as i wanted it and orient parts. The slicer also added some internal support for the print, shown in grey. Off to the printer for a couple of hours, whilst the dog gets a walk and we make tea. The printed parts and other bits ready for assembly, well... just push them together really. The body needed the 5mm hole tapping to take a bolt I had earlier polished flat on a diamond stone. Here is the first test of the components together, I need to set the screw with nail varnish and probably glue the plug in too with varnish. The vial is a firm push fit so no worries over that falling out or getting out of alignment. It's just resting on the shank of an 8mm drill for now, I will make a proper shaft for it to go on later. Other than the print time it was pretty much a couple of hours work and hopefully a useful tool for the lathes. Very cool Joules, I might just make one like it. Thanks for posting. STL files?....is that like a rough cut file? The powdered Rhino keeps the STL in check, though it can be embarrassing when it flares up at parties. My other half just tells me not to mention it when we are out. How do you calibrate this when the lathe is not level, for example, sitting on a sloped garage floor? Use a second level across the bed and initially match the bubble positions. Once the tool height is correct you can then adjust the setting tool bubble to centre. 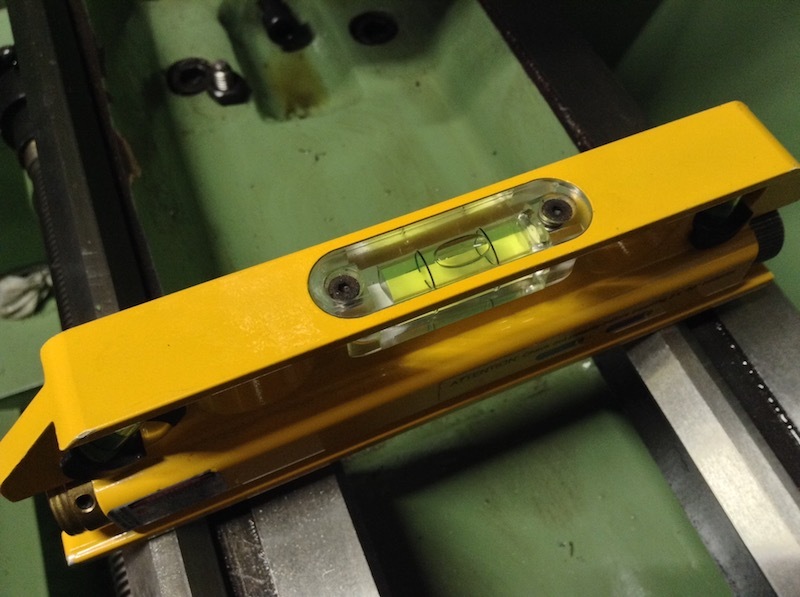 It means the level tool can only be used on this machine accurately. But they are cheap enough to make one level per machine. Lock the adjusting bolt with nail varnish. 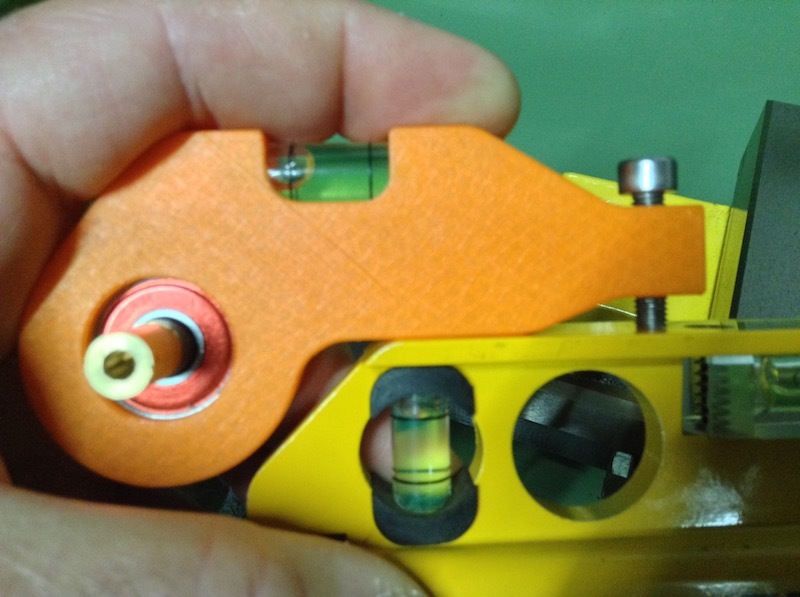 The flat area along the bottom of the tool is the centre line of the bearing, so a set square base pressed against it allows the bolt position to be initially set. 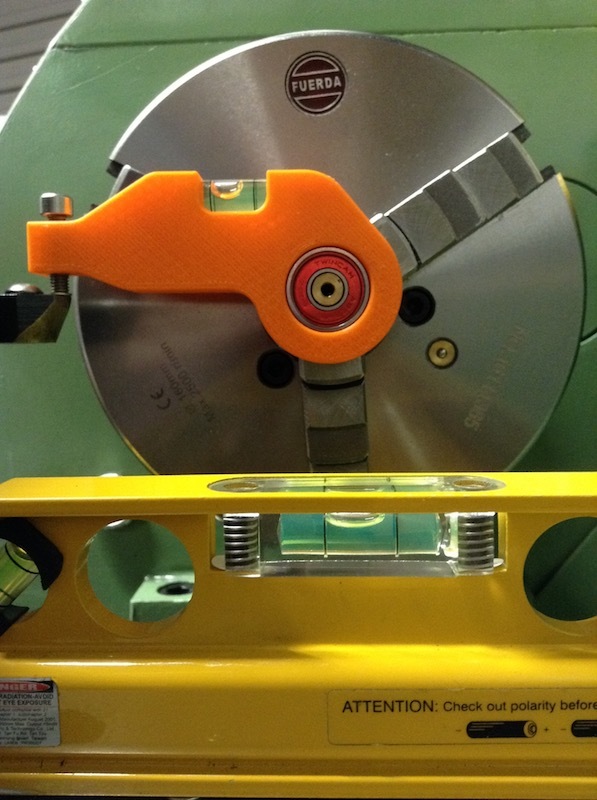 Do a test cut and see if you still get a pip, adjust the cutter as required. That way you don't need a second level, as above zero the bubble once calibrated. This is how I do the initial setup for the bolt position, it gets you pretty close. Now setup a level on the bed and get the bubbles roughly in the same locations. You really are going to be out by a tiny amount unless the ship your lathe is on is in heavy seas. Saying that, the old workshop in Christchurch was very much rock and roll. The above photo was staged using a washer under the tool and under the level, but you get the idea. The workshop floor isn't level and the lathe is really out this much, but as mentioned before, a test cut confirms if your on centre, then adjust as needed. Once setup all the following tools can be set. It sure makes swapping tools out in my limited number of quick change holders a lot simpler and quicker. I must admit that despite having the Edge tool on a rack by the lathe I still tend to use the 'trapped six inch ruler' method, then maybe a tweak after a test cut. The ruler method works on the actual contact point of the tool, whereas the Edge tool rests on the top, so if there is a chip breaker groove for instance, or the tool has negative rake it's not strictly measuring the correct place. Both the level method and the ruler method get you into the ball park and I suspect are equally valid, then a bit of a tweak on a test cut is the last word. What I really like about this is you obviously had a nice time making it and sharing it! I have to say Joules, the finish on that 3D print looks excellent. Was that a top end super-duper machine or a little whizzbang one? It's a low-mid range printer, that goes through extensive tuning in house. 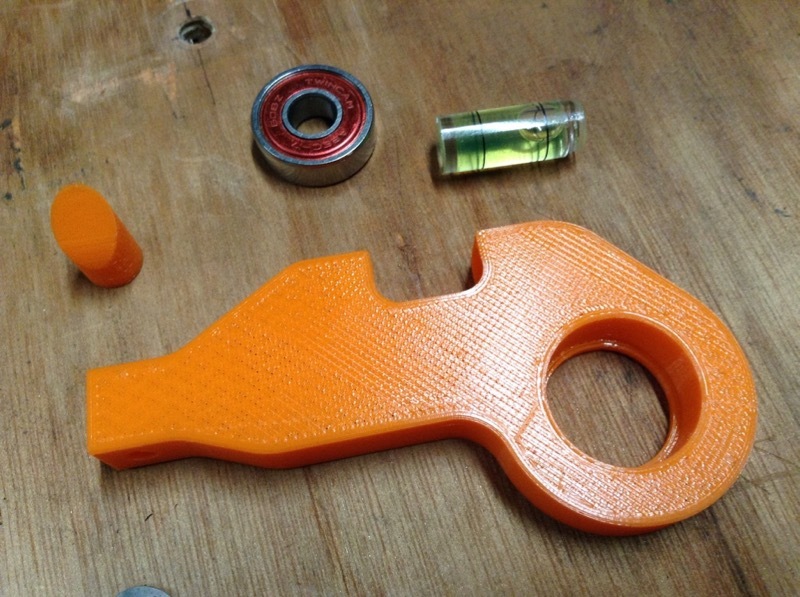 I made a set of alignment tools, as I have three of these printers used for work. They are serviced once a year and rebuilt, so the effort making custom tools has been well worth it. They don't produce this quality off the shelf, but did meet the requirements I had for the chassis. Cheers Matthew, yeah it is enjoyable designing in CAD and then making something with no hands on, and no swarf. Work has fell off a cliff at the moment, so I have way too much time on my hands than is safe... Plenty of small designs and widgets keep the mind active and the machines in working order. Jay, I added the STL file. If you do have a shot at making one, post a picture here. That goes for anyone else too. p.s The plug that seals the vial in place could do with a slight increase in diameter by 0.1mm unless you glue it in. Joules about the stl file you posted and grabbed . The site requires a log-in or register which may put some off. Thanks Pete, I forgot you now need to register to download files from GrabCad, though I must say if you are into 3D printing it's a site well worth using. I have added a zipped version of the STL for anyone not wanting to sign up to yet another place. I like the addition of the level. Just setting up to do some threading and hadn’t got my threading tool in a holder. Didn’t want to disturb the work in the chuck, so set the tool setter in the tail stock and dialled in the holder in about 30 seconds. Now to earn todays crust. I passed on your files to my friend and he kindly printed 3 units for me. I assembled the tool setter with the shaft protruding on both sides, to be able to mount it in the spindle or the tailstock. The first time used it, I calibrated it in my spindle and then check it in the tailstock , to my surprise the bubble was off. I had to put a .020" shim on top of my tool bit to get it to level again. My tailstock is adjustable left and right but not up and down ;( at some point I will put a shim in between the base and the top part of the tailstock. 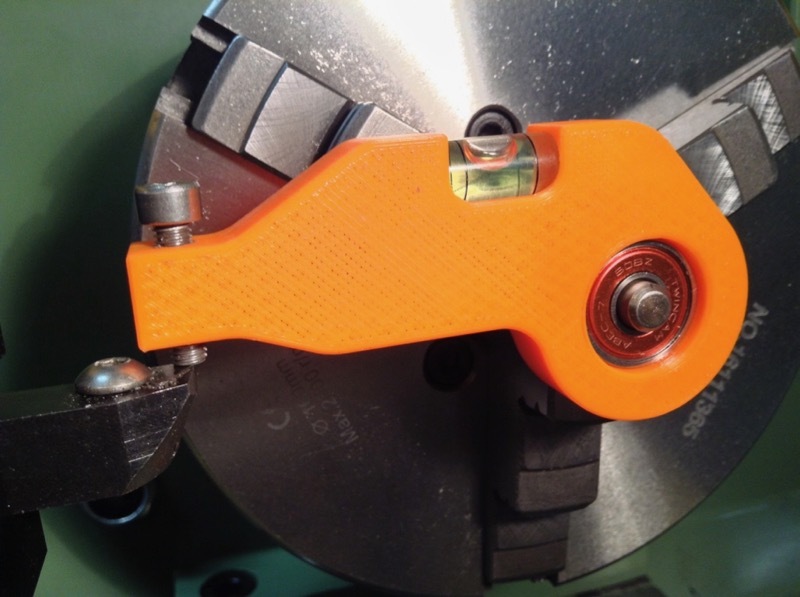 The good news is when I tested the tool setter in my lathe at work it worked perfectly, cutting on center and leveled in the spindle and the tailstock Thanks for posting and sharing the files to build the tool setter.